I think we all know that organising begins with decluttering. I won't get into that in this series as I've covered that in this blog post - we will move onto the next step in organising: finding storage space. Your storage space should always have “room to grow into” - a bare shelf, an empty drawer, storage baskets that aren't full to the top. This room to breathe provides a feeling of security and eases pressure. It's the same principle as using only the top half of your petrol tank – if you fill up every time you get to half empty, you'll never run out of petrol. There will always be some for emergencies. Try to think logically when storing items in your home. This means finding a storage spot that makes sense to you and how you live your life. It may even seem illogical to someone else at first glance – but you'll know you've got it right when you find that moving an item to a logical spot streamlines your life. For example, I might always drink tap water and you might always drink juice out of the fridge. For me to tell you to store your drinking glasses near the sink would be logical to me but not logical to you – why walk all the way across the kitchen and past the sink to get a glass when you want a drink out of the fridge? It would be more logical to you to store your glasses near the fridge. Sometimes we store things where we do just because that's always how it's been done. It might seem more logical to store CDs in the living room, because that's generally where you'd expect to find them, but if you no longer have a hi-fi there but do have one in the kitchen, then storing your CDs anywhere other than the kitchen is not logical. When you make your switches it will not be comfortable for a while. You will automatically go to where you used to store things and then remember that they're not there anymore. But after a while you will become accustomed to your items being somewhere new and will find that your life is more streamlined. The first step is to be mindful. Keep a notepad with you if it will help. 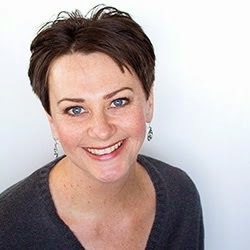 Make a note of when you feel frustrated when trying to access an item – for instance when you are preparing a meal and want to use the glass baking dish that is at the bottom of a pile. Be aware of which items in your home you use every day, which items you use once a week and which you use less frequently. 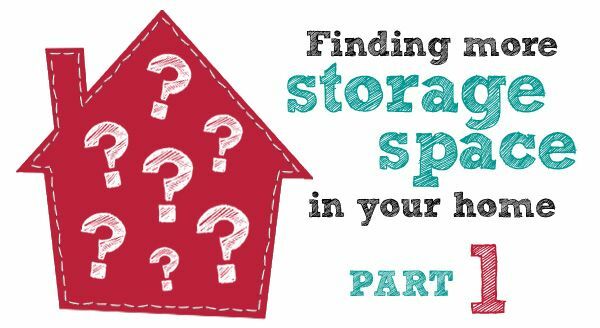 This is key – you need to know which items qualify for which category of storage space (which we'll cover in the next post in the series). Think logically about how you use your items not just to decide which kind of space they qualify for but also to decide which room they will be stored in. An example would be: If you don't like taking your clothes into the bathroom with you but prefer to get dressed in your bedroom then perhaps you'll need a hook or rail on the back of your bedroom door for your towel. Grab it when you go shower, and hang it back up in your bedroom when you get dressed. It will save you a trip to the bathroom to hang it up later. The "obvious" place to store towels would be in the bathroom but it might not be the most logical for the way you live your life. Most people store their clothes, underwear, socks and shoes together in their bedrooms. In our home our children don't wear socks and shoes in the house and only put them on when going out so we store their shoes and socks in the hallway where we'll need them. Maybe most people store their ironing boards in the kitchen or pantry but if you only ever iron one item at a time when you want to wear it, perhaps storing your iron and ironing board in your bedroom would make more sense. You can iron an item of clothing right before you wear it, even while in your undies. If you read stories to your child only at bedtime, there's no point storing the children's books in the playroom downstairs. 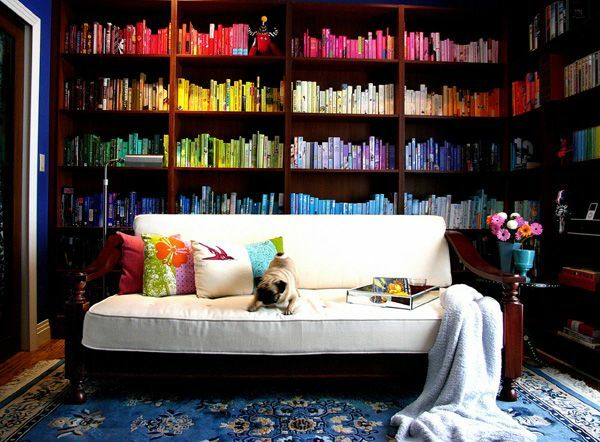 If you read snuggled up on the couch in the afternoon, there's no point storing the books in his or her bedroom upstairs. If you read in both places, consider keeping the books you own upstairs and creating a spot downstairs for library books – they will then stay together, not get mixed up with your own books and be easily accessible for your next trip to the library. And you won't have to trek up the stairs to round them up when it's time for a library visit. My wardrobe has my own logic applied. I have all of my trousers hanging together, then all short sleeved t-shirts, long sleeved t-shirts, cardigans and jumpers, long sleeved shirts and blouses, short sleeved shirts and blouses, short sleeved cardigans, coats, etc. When I am getting dressed and reach for a t-shirt or am wanting a specific one, I want to look at all of my t-shirts together. It makes sense to me. However, I know of people who organise their clothes in colour order – all red items together, regardless of type, then orange, then yellow etc. 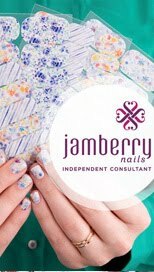 Or you might want to order your things by style – casual together, dressy together, office or church wear, etc. When organising books on a bookshelf, you might like to organise yours by size, by topic, alphabetically by author or title, or even by colour. The trick is to find a system that makes sense to you and then apply it. Organising your things isn't just about having things look neat, it's mainly about having things be easily accessible. So you need to think about things and be mindful as you use them. If you want a particular book, let's say a gardening book, would you prefer to go to your bookshelves and look for the red spine? Or would you prefer to look in the gardening section? 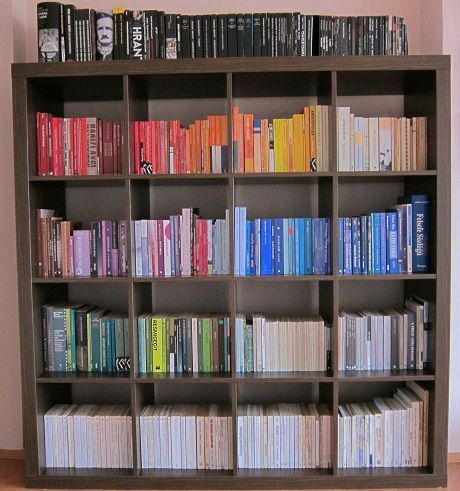 If it's the former, then you might want to organise your bookcase by colour. If it's the latter, then separation into topics would be the way to go. Don't be frozen by indecision, this isn't the final exam – you can always change your system later!